Blackboard Course Shells - Now Available for Fall! We are happy to communicate that Fall course shells have now been successfully loaded in Blackboard and have been associated with their instructors. Professors should be able to access them now by logging in to Blackboard via Artemis. Be aware that students will not yet be populated within courses, and thus will not have access to them, even if the instructor makes the course shell available. The loading of students into courses will take place during the course of the week of August 20. Those that use a course master may not yet have the associated content loaded into the shell. At this point, all A term master course content should be loaded into the Blackboard shells. The work of loading B term course content should be completed this week. The link to the Online Syllabus Builder is now visible within my.fscj.edu under the newly designed Faculty tab. Please view our separate post regarding the online syllabus builder for more information. If for any reason you have issues with access to Blackboard or are unable to view a course that you have been assigned for the Fall, please contact EdTech@fscj.edu. I was recently encoded in a course, however, the shells have not appeared within Blackboard. When will they appear? Any courses that were encoded within the last week or so will not be available in Blackboard until the final migration is complete and all data has been transitioned over. We appreciate the patience of all instructors who were recently added. My course and lab appear as two separate shells. Many courses with a hands-on facet are experiencing this issue--not exclusive to pure sciences--as a result of the way that these courses are encoded in PeopleSoft. When a student enrolls in the lecture component, they are automatically enrolled in the lab. However, these courses are still graded as one course offering. In order to reduce confusion for both faculty and students when navigating Blackboard, we would like to ask all faculty with duplicate course shells to ONLY make the lecture component available to students and keep all other components unavailable. 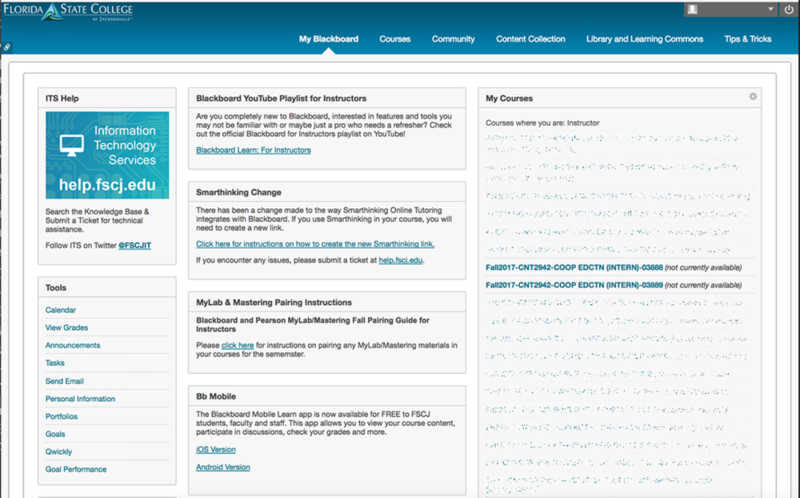 To identify which Blackboard shell was created for the lecture component, look at your course schedule within myFSCJ. As shown in the example below, “lecture” or “laboratory” is marked in parentheses after the course title. In the first column, note that the course code is the same, but the reference number in parentheses is different for the lecture (3888) and the laboratory (3889). When looking at courses within myBlackboard, the last four numbers in each course shell title matches reference number seen in the first column of the faculty schedule in myFSCJ. Thus, in the provided example below, the second course, COOP-EDCTN (INTERN)-3889, is the laboratory component and should not be made available to students. Students do not see courses that are not made available in myBlackboard and therefore will not be aware of the duplicate course shells. Please know that this process will not have any effect on students’ final grades. Will the class roster populate students info at a later time? Yes. The creation of course shells and instructor association was the first step of the integration of PeopleSoft with Blackboard. After receiving feedback from professors, we prioritized the creation of course shells so that content could be built in advance of the Fall Semester. The addition of students to Blackboard requires a change to student user IDs that cannot be performed until the Summer Semester's end, so as not to disrupt ongoing classes. We’ll be sending more information out about the progress soon. The IT Maintenance Dates are not currently visible within the Syllabus Builder, however often used to inform students and for planning purposes. We are currently working to integrate the dates within the online syllabus builder, however they may not be ready prior to Fall. You can visit the Calendar page located within fscj.edu to view a full Collegewide calendar. August 26-27, Weekend in between grade submission and start of term. Blackboard Upgrade in the Works! FSCJ is planning to upgrade Blackboard on May 10, 2017, with outages certain on May 10, and possible throughout the day on May 11. Blackboard releases version updates twice a year, in order to introduce new features and address bugs that are problematic in old ones. Currently, we are a bit behind in adoption of Blackboard versions, and will be making a larger leap from Version 9.1 CU 5 2014 to Version 9.1 Q2 2016. There is very little that needs to be done by instructors or students to insure that the upgrade is successful; the Academic Technology Department will work with Blackboard to complete the transition as seamlessly as possible. We are asking, however, that professors export any summer courses that you are working on now and store them locally for backup purposes. For more information on how to do this, visit the FSCJ Knowledge Base. Though the Blackboard interface will not change substantially as a result of this upgrade, and most things will look and function the same, users will notice some small changes, detailed below. This release fixes an issue with email sent from Blackboard. Some email clients do not use the reply-to header of emails sent by BbLearn to populate the "To:" field when the user replies to an email. As a result, some students were confused when they received email from do-not-reply@<bblearn_domain> instead of their instructor's email address. This update will fix that problem. Learn 9.1 now supports the Microsoft Edge browser. The Content Editor now supports HTML5 Audio and Video playback in Chrome and Edge browsers. For users who are interested in using these rubrics, Blackboard has made them available for download and import. Each rubric has been built and formatted appropriately so it can be imported to your courses and used anywhere you can align and evaluate with rubrics today. The downloadable rubrics are available in US English only because this is how they were authored by AAC&U. As we approach the end of 2016, the Information Technology Services Team would like to wish each of you Happy Holidays. Please keep in mind during this season we will have a scheduled maintenance period from December 23rd – January 1st to perform the updates necessary to provide you with optimal service throughout the year. We know this may be inconvenient at times, however, it is essential for us to continue to maintain the systems properly. We will have processes in place to route you to available resources as needed while systems are down. Thank you for your patience during this time. Blackboard will not be affected and will remain online throughout the maintenance period. PeopleSoft, ServiceNow, and Campus Wireless will all experience periods of downtime during the break. To minimize the effects of the downtime, student registration will remain online for most of the break, with the exception of the approved 3-day maintenance period from December 26th – 28th. If you have not yet enrolled in the password reset tool, or if your password will expire over the break, visit password.fscj.edu. You can access Blackboard while other systems are down by visiting artemis.fscj.edu, through which you can obtain access to the LMS. The portal help.fscj.edu will remain available over break with the exception of a small window of time during the evening of December 23rd. If you visit help.fscj.edu after this time, you will see a newly redesigned and updated site, to be introduced in 2017. You can follow ITS on Twitter for periodic service updates @FSCJIT. In closing, we hope you have a wonderful holiday with your family and friends and we look forward to serving you in 2017 with exceptional technology services. FSCJ's Educational Technology team's Idea Lab Poster presentation won the People's Choice award at the 2016 New Media Consortium summer conference in Rochester NY. The presentation highlighted the process for bridging the technology gap for lower socio-economic community college students at FSCJ.